Brief: This tutorial shows you how to create a bootable Fedora USB in Ubuntu Linux. Focusing on beginners, this tutorial takes the graphical way of creating Fedora live USB. Fedora 24 has just been released and I have been itching to try my hands on it. Mostly I use Ubuntu but I keep on trying other Linux distributions every now and then. If you are like me, perhaps you might also want to take Fedora 24 for a test drive. Live USB is the best way to try out a new Linux distribution. In this tutorial, I’ll show you how to create a live USB of Fedora in Ubuntu using a graphical tool. For information purpose, I am using Ubuntu 16.04 to create a bootable USB of Fedora 24. But normally, these steps should be valid for other versions as well. Let’s see how to create live USB of Fedora in Ubuntu. Running a checksum is always helpful to determine if the file you downloaded is healthy or not. If checksum fails, this means your downloaded ISO is corrupted and your live USB will run into trouble. Use this value in the tool and click on Hash button. If the checksum passes, you’ll see a green light. Note: this value can be changed in future if you are downloading a new release of Fedora. Please leave a comment to inform me to update the article, if that happens. Until now, Unetbootin has been my go-to tool for creating live USB in Ubuntu. But there is a new cross-platform, open source tool in the market to burn images to SD card and USB. It’s called Etcher. It has a sleek and good looking modern interface and it works pretty fine despite being in beta. You can download the AppImage of Etcher and run it. Quick word about AppImage. AppImage is a new packaging system that has similar aim as Ubuntu’s Snap packaging. These packages run on any Linux distribution and they don’t need to be installed in the system. They take care of the dependency issue as well. More about it later. Once you do that, we are good to go. Plugin your USB. Format it as FAT 32, if required. Run Etcher by double cliking the downloaded AppImage (which is executable now). You’ll see an interface like this. Click on Select image and browse to the location where you have downloaded the Fedora ISO. You’ll see a Success screen when the entire burning process is completed. Cool!! Now you have your Fedora live USB ready. You can test it now. Don’t forget to change your BIOS or UEFI settings to change the boot order to boot from removable media/USB. One more tip, when you boot from the live USB, choose the option of Try Fedora live. It works better with this option. In the live session, you’ll be provided with the option to either try or install Fedora. The choice is yours here. 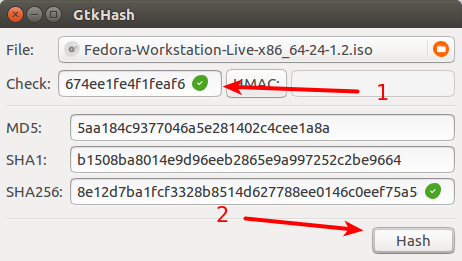 I hope this tutorial helped you to create a live USB of Fedora in Ubuntu. If you have questions and suggestions, drop a comment.